Modern methods of treating gold-bearing quartz and the scientific separation of gold from impurities have not destroyed the romance always associated with the discovery of gold. PRIMITIVE methods of searching for gold are rapidly giving way before modern scientific processes, and the lone prospector in search of a fortune has become comparatively rare. The individual now has a slender chance of making a successful “strike”, but the romance has not yet departed from gold mining. The old-fashioned prospector seldom had much education, but was a good practical fellow with much experience of his profession and with unlimited optimism and courage. He needed the legs of an ostrich, the eyes of an eagle and the heart of a lion. Many prospectors started out, but few arrived; many left their bones in the bush, and pitifully few found fortune. CYANIDE TANKS at a gold mine in Johannesburg, South Africa. Finely ground ore is admitted to these tanks and treated with a weak solution of cyanide, which dissolves the gold. The solution is then passed over zinc shavings, and the gold precipitates. The most important source of the world’s gold is the Witwatersrand (universally known as “The Rand”), in South Africa. 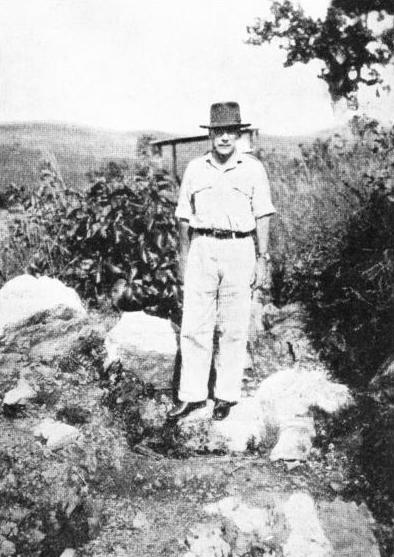 The Main Reef Leader, which has been the fortune of the Rand, was discovered in 1866 by George Walker, who was found to be in such poor circumstances after the war of 1914-18 that the Transvaal Chamber of Mines gave him a pension. Another lone prospector, who discovered the rich field of Ivanovka, in Russia, was rewarded with a pot of jam and a job as night watchman and was told to think himself lucky not to be locked up for prospecting without a licence. Sometimes, however, these prospectors made good. The brothers Struben, the real pioneers of the Rand, did well, but they were not poor men when they began. About thirty years ago there died in London an old Irish prospector named John Brown, who by sheer hard work had wrung a fortune out of the reeking swamps of Surinam (Dutch Guiana) with his own brawny arms and with the help of a few natives. He came to London to enjoy himself and did not open a bank account, but kept his gold in a box under his bed. In recent years the boom in the price of gold has revived the nagging activities of the prospector. He is still out, following up streams, scooping up handfuls of sand and washing them in his pan. Sometimes he makes more elaborate, but still primitive, wooden apparatus for separating the metal. Such apparatus always works on the principle that gold is much heavier than the quartz with which it is found. Sometimes the lone prospector will find a nugget, which is an agglomeration of flakes often caused by the pounding action of stones in running water, an action which causes the smaller grains to coalesce. The wise man looks for the finer stuff, which, though less spectacular, is more regularly found. The original source of all the gold in the world is the interior of the earth. When the siliceous vapours rising from unknown depths became fluid and then consolidated, the minerals contained were fixed in the quartz veins that were formed. Gold may be so finely disseminated in those veins as to be invisible, or it may be embedded in crystals of pyrites or other sulphides. When such a vein disintegrates under rain and frost, debris is carried away in the form of gravels and sands. This accounts for the presence of gold in many rivers. The pyrites is also broken up, and gold flakes within it are set free. Some of the gold is washed deeper into the ground, making the spot richer than before. This richer, weathered outcrop of a vein is known as the “gossan”, or “gozzan”, from an old Cornish word. Below the gossan the ground is poorer, and lower down is a second enriched zone, below which is the unaltered rock where the gold content is generally low. From the earliest days gold has been worked by primitive methods, either from gossans or from streams farther down. Only in comparatively modern times have veins been mined to any depth. Generally they have been opened by adits, which are tunnels in hillsides. AN OUTCROP of gold-bearing reef generally has the richest content of gold. The illustration shows a reef outcrop 16 feet wide on an African concession. A rich weathered outcrop is known as a gossan, derived from an old Cornish word. The fine gold may also be left in the dried-up beds of rivers which no longer run, and when, as often happens, ancient river beds are buried under a thickness of later deposits, they are known as deep leads. Such gold deposits have given mankind great wealth in California, Australia and Siberia. The incomparable Rand is now regarded as an extremely ancient alluvium, buried under a tremendous cover of later beds. Other ancient alluvial beds are found at the tops of mountains. Such are the deposits on the Kuen Lun, the lofty Asiatic range, where for many centuries the Chinese and Tibetans have been extracting great wealth by the most primitive methods. The winning of alluvial and the winning of reef or vein gold are totally distinct problems, frequently undertaken by different companies. 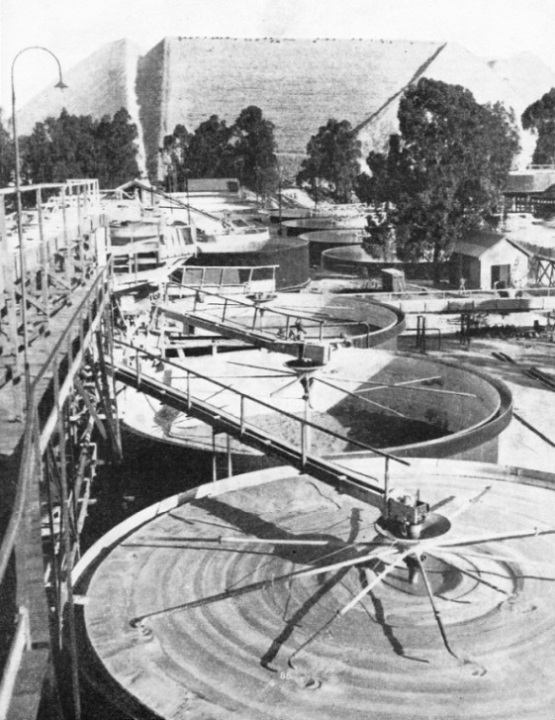 The pioneers of modern methods in alluvial work were the Californians, who developed the systems of “hydraulicking” and dredging. Hydraulicking is the cheapest method of all. It consists of washing down the gold-bearing earth by a powerful jet of water. The earth is directed through a nozzle into sluices in which the gold is caught. This method is suitable for countries whore there is an abundant supply of water, though it may be necessary to carry the water for many miles in “flumes” or canals. Great quantities of gold have been recovered in this way from deposits too poor to exploit by any other method. A gold dredge is only a modification of the ordinary bucket dredge which is so familiar an object in harbours, where it is used for deepening the water. It consists of a number of buckets on an endless chain, passing round a vertical frame, so that each bucket scoops up a mass of mud and tips it into a barge. When used for gold, the mud is passed over plates of mercury, and the gold is recovered by amalgamation with that metal. A dredge may cost £75,000, and local conditions must be studied thoroughly before such expenditure is undertaken. Dredges have the advantage that they are efficient and cheap in action, can work low-grade sands, and can be used also for tin. They are built to-day on the Clyde, and are at work recovering gold in Russia, West Africa, Australia, Yugoslavia and other parts of the world. When it is necessary to tunnel by adits into hillsides, or to sink shafts to reach gold, then true mining operations begin. 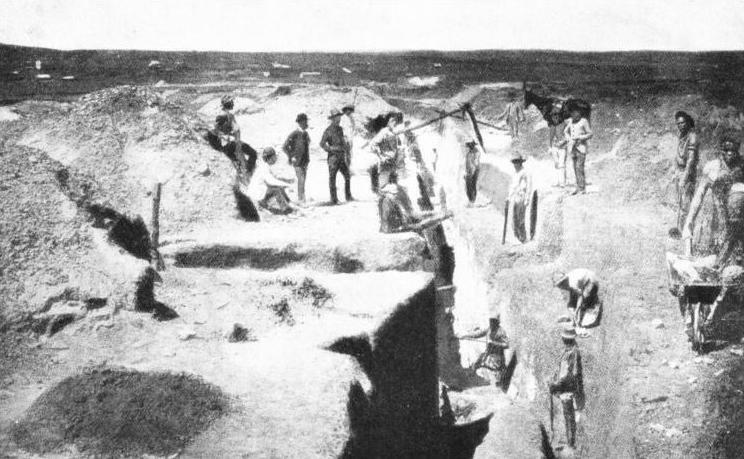 The working of deep leads or buried “placers”, as gold-bearing sands are called, may be regarded as the transition from alluvial working to true mining. The sands are raised by ordinary methods and are passed through running water over a series of boxes and sluices where the gold is caught in the usual way. 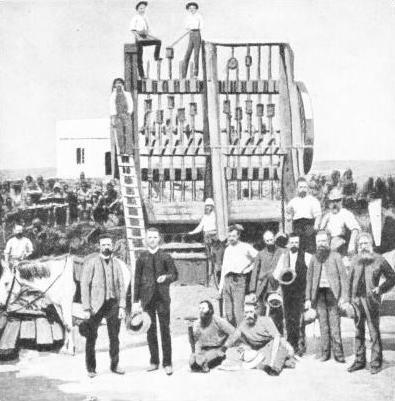 OPENING UP ONE OF THE FIRST MINES at Johannesburg in 1886. To-day the mine shafts reach a depth of more than 8,000 feet. The temperature increases with the depth, but in the Rand the increase is more moderate than in most other countries. More than half the gold in the world comes from the Rand. In 1935 the total Rand output was 10,773,041 fine ounces. Many adit mines are exceedingly profitable, for they do not involve the huge capital outlay on shaft sinking which is so formidable a feature of mining finance. A new mine on the Rand may cost well over £2,000,000 in sinking and equipment, but an adit mine may reach the dividend stage on a capital of less than £400,000. Gold mining has expanded enormously during the last sixty years, but there are still old mines at work. In Colombia, South America, are British-owned mines dating back almost to the eighteenth century, and in Brazil the St. John d’El Rey mine, which works gold 5,000 feet below sea level, has recently issued its 104th Annual Report. There are firms of consulting engineers in London which have been famous in the mining world since pre-Victorian days. The Rand, in the Transvaal, was discovered about fifty years ago. It has for long produced half the gold supply of the world. In 1935 the total output of the Rand was 10,773,041 fine ounces, valued at £72,306,436. The production of the Rand since its opening is over 300,000,000 ounces, yet the ground is far from rich. It is necessary to crush, and to pass through an elaborate treatment, a ton of ore, at a cost of about 18s 9d, to recover less than a quarter of an ounce of gold. What is so wonderful in the Rand is not the high gold content, but the regularity with which gold is found. Over a distance of about sixty miles there is a concentration of mining and metallurgy upon a scale that is unparalleled. The shafts are generally rectangular, divided into several compartments, vertical for the first few thousand feet, and then sunk on the incline. Through them men travel down and up, the ground is hoisted, machinery sent down and water pumped up. Air and electric current are sent down to depths of 8,000 feet and more. The temperature of the earth increases with depth, hut the Rand is fortunate in this way, for the rise of temperature is less steep than in most other countries. The final limit of profitable deep mining will probably be set by the cost of ventilation rather than by that of hoisting the dirt. Underground is a teeming city. Men are hard at work perforating the hard rock with clattering drills driven by compressed air, the exhaust of which helps the ventilation. The rock is shattered by explosive cartridges fired electrically in the holes thus drilled. The dirt thus produced is loaded into tubs or skips, which are hauled to the shaft bottom and thence hoisted to the top. This is done, in the most modern mines, by electrical winding engines. These are so powerful that they can handle a cage full of rock weighing altogether, with the 8,000 feet or so of steel rope, about 38 tons. This load is started from a stationary position at a depth of a mile and a quarter and run up to the surface at a speed touching 35 miles an hour, yet it is landed gently and accurately. The machines that do this are among the most impressive contrivances of the human mind. In spite of the tremendous powers involved, they can be controlled by a single man, and are foolproof. The mechanical problem is complex, because the load is started from zero, accelerated to the maximum, and then retarded to permit a gentle landing, while the load is being constantly reduced as the cable is wound on the drum. When the ore reaches the surface, the miner hands it over to the metallurgist. The metallurgy of gold is an ancient art. The Romans understood the use of quicksilver for amalgamation, and this is still one of the essentials of the industry. But it is only in modern times that men have learnt the use of solvents. In 1848 Plattner used chlorine, but it was not till 1890 that MacArthur and Forrest won a victory by patenting a process known to Schecle in 1782, the solubility of gold in cyanides. This revolutionized the treatment of gold. It permitted the recovery of the finest, even invisible, particles, which had, before the perfection of the process, been lost. 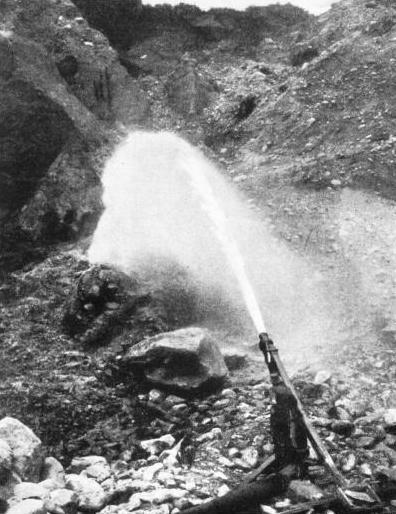 HYDRAULICKING is the cheapest method of obtaining gold from alluvial deposits, and was developed originally by the Californians. A powerful jet of water is directed through a nozzle. The gold-bearing earth is washed down into sluices, where the gold is caught. The rock comes up in big angular lumps, the smashing up of which is a serious problem, especially with the extremely hard quartz of the banket, the mother-rock of the Rand. The lumps are first broken, by powerful crushers with jaws of manganese steel, to lumps about one inch in size. These are then fed to stamps. The stamps consist of a row of heavily shod steel rams set vertically in a frame on massive foundations. They are so operated that they are raised a few inches and dropped upon the ore, which is passed beneath them. A stamp battery requires precise knowledge and skill to induce it to give the best results. It is important, for instance, to regulate the order of fall, for if this were in numerical order, there would be a tendency for the ore to pile up at one side and to become clogged. Experience has shown that in a five-stamp battery the best combination is 1-3-5-2-4. The key to the eventual efficiency of the treatment is the fineness to which the ore is ground. It generally pays to grind as finely as possible, but grinding is expensive, and each ore has to be treated on its merits. If there is much coarse gold, it pays to remove it by amalgamation, and to deal with the finer stuff by cyanidation. In the amalgamation process the discharge from the stamps is passed over plates of pure copper covered with mercury. The minutest care is paid to every detail, such as the thickness of the plates, the angle of slope and the cleaning of the surface of the copper. The mercury which has caught up the gold and become an amalgam is periodically cleaned off and heated in a retort, the quicksilver passing off as vapour to be recovered for use again, while the gold remains behind. Coarse gold is also caught by passing the finely ground ore over sloping tables covered with fluffy material. On the Rand corduroy is often used, the ribs being placed across the direction of flow of the water to catch the gold. Every four or five hours the concentrate thus made is removed and passed into the mercury barrel for retorting, while the tailings, as the thin residue is called, may be treated with cyanide. The cyanide process consists of stirring the finely ground ore in tanks containing a weak solution of cyanide, which dissolves the gold. The solution is then passed over zinc shavings and the gold settles in the form of a fine dark brown powder. This process, which saves the finest invisible gold, is in its essentials simple, but it requires great care and exact knowledge. When there are impurities in the ore they may be removed by smelting in the presence of fluxes (chemicals which assist fusion). The deeper parts of a vein are more difficult to treat than the upper parts because of the presence of sulphides. These and other minerals that interfere with cyaniding must be removed by roasting. Heavy minerals may be separated by passing the ground ore over shaking tables, the concentrates then being treated with cyanide. A recent development is the flotation process. In this the crushed ore is stirred in a tank with air and certain chemicals so that the rising air bubbles pick up the sulphides and the gold, while the “gangue” (quartz and dirt) remains behind. This process has many advantages, but it is more complicated in application than would be expected. THE LAKE VIEW AND STAR MINE is one of the largest gold mines in Western Australia. The purest native gold yet found is obtained in Australia, and contains 99.65 per cent of the metal. In 1925 gold to the value of £2,375,280 was mined in Australia, compared with £42,285,152 from the great goldfields of South Africa. Another method of recovering the gold from the cyanide solution is by electrolysis. This process has been developed on the Rand. The last stage is the smelting of the gold in crucibles with fluxes. The molten gold is poured into a mould. As soon as it is set the slag which adheres to it is broken off by hammering. The remaining ingot, which always contains some silver and sometimes a little copper, is dispatched to the bullion broker or refiner. Refining, the removal of the silver and copper, is known as “parting” the gold. The ancient method of purification by fire has been replaced largely by blowing chlorine through molten gold. Two important matters in the handling of gold are sampling and assaying. A sample of a vein must be a true representative of every part of the vein. In the old days samplers and assayers were obliged to beware of attempts at “salting” or doctoring the results. An unscrupulous man, by the addition of a minute particle to a small sample, could materially increase the figure of gold content. Men have been known to carry gold chloride in their mouth and to spit the yellow-looking fluid as though accidentally upon a sample, when the assayer was not looking. Engineers reporting on a mine for sale have been offered enormous sums to take their returns; in one instance a bribe of £250,000 in cash was offered. Assaying, whether of ore or bullion, is responsible work. The precious metals are almost invariably assayed by roasting. The gold is made to combine with lead, the dirt passing into the slag; the lead “button” is then roasted in a small dish called a cupel, which absorbs the lead, leaving a button of gold, the weight of which is compared with that of the sample. Gold is imported in ingots of various shapes and sizes. Siberia uses the pood unit, which is equivalent to about 36 lb. avoirdupois, in a mould resembling a baking-tin in shape. The ordinary “bank bar” weighs 400 oz, and is worth about £2,800. It is almost pure, containing only five parts of silver per thousand. Fineness of gold is expressed in parts per mille - that is, per thousand. The purest in ordinary use is 999.6, and the finest of all is 999.9 per mille, which has only one part of silver in ten thousand. This is used for standards and for other purposes in which a trifling impurity might affect the physical properties of an alloy. AN EARLY STAMP BATTERY on the Rand. This machine, built in 1887, was one of the first ten stamp batteries to be used on the Rand. These machines are used for breaking up the ore into fine particles, preparatory to treatment in the cyanide tanks. Each stamp is raised and dropped in turn on to the ore as it passes through the machine. The stamps must be regulated so that they do not operate in numerical succession, otherwise the ore would pile up at one side of the stamp battery. So long as the gold remains in the mine it has only potential value. In remote mines it may remain many months before reaching the market, but from that moment the owner must take into account the loss of interest on the capital value of the bullion. With gold at about 140s an ounce, this amounts to nearly a penny an ounce a week. In parts of South America the traveller in lonely places may meet pack mules carrying ingots without any armed guard. The protection is the weight of the ingots, which are too heavy to be handled with ease, and as the country is not suitable for lorries there is no scope for gangster methods. In Siberia some outlying mines are isolated during the summer and the gold is hauled on sledges on the ice during the winter. There it is always accompanied by an armed guard with orders to shoot at sight any suspect coming near. If its destination be the vault of some national bank, the gold does not appear on the market, and serves no useful purpose. The greater part of the gold produced in the world is within the British Empire and the chief market is London. There officials sit every morning in solemn conclave in the offices of N. M. Rothschild and Co. and determine the price for the day. To-day, when a prospector makes a find, the first thing he generally does is to form a syndicate, usually in the nearest civilized place; or he may sell outright to a syndicate. The syndicate may then put up enough money to undertake some development or send a representative to the best financial centre, where the property will be sold to a promoter, who will make a development syndicate to open Up the mine. The more spent at this stage the better chance of a successful issue, and it is common to find £20,000, £50,000 or more laid out in sinking trial shafts and driving levels to show as much ore as possible, and the ore must be abundantly sampled. THE LARGEST BATTERY HOUSE on the Rand is situated at Randfontein, west of Johannesburg. Six hundred stamps are housed in this building, which forms a striking contrast to the early methods of stamping as illustrated in the upper photograph. A modern stamp battery consists of a row of heavily-shod steel rams set vertically in a frame on massive foundations. The syndicate may proceed to a public issue. It will then require the detailed report of a consulting mining engineer of established reputation, on whose report it will go to the public. Such a man may command a fee of one or even two thousand guineas, and his name must be known in the financial world where the money is sought. It is an old-fashioned custom to divide the capital into three parts, of which one third is working capital for the undertaking, one third the purchase price to the pioneers, generally paid in shares, and the remainder the cost of issue and profit to the issuers. The issue is commonly made through firms called issuing houses, but it must first pass the censor, because it is useless to appeal to the public without an assurance that the Stock Exchange will give permission to deal in the shares. This has caused much heartburning, and may have operated hardly in individual instances, but that it affords a powerful protection to the public cannot be questioned. Another method is to sell the prospect to one of the great groups. The formation of vast groups, owning or controlling a great number of mines, is one of the characteristics of modern mine finance. The power of these groups is tremendous, and they have such an accumulation of knowledge, skill and experience behind their enormous wealth that they are a powerful element for stability and confidence. They are so strong that when they require to make a new issue a million sterling or more will be taken up, if not in their own offices, at least by their own shareholders. Not long ago West Witwatersrand Areas, for instance, offered 100,000 ten-shilling shares at £10 each. They were taken up at once by the original subscribers, so that a nominal £50,000 brought in £1,000,000. Such undertakings are possible only to immense concentrations of knowledge and finance. Nowhere else is there any such reserve of skill, knowledge and experience of the gold-mining industry in all its aspects as in London. 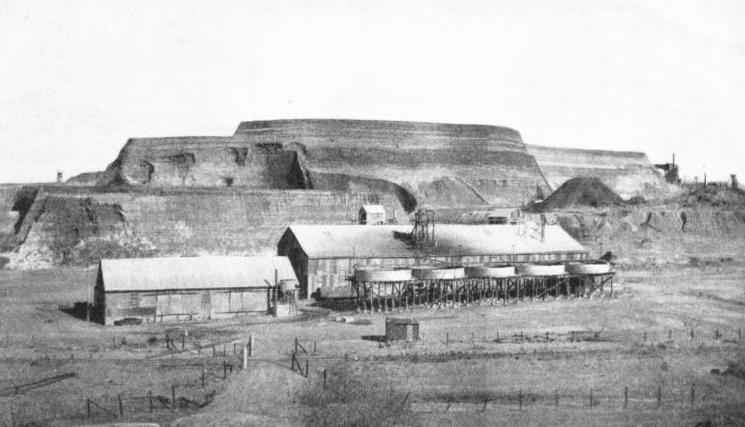 ONE OF THE NEW SOUTH AFRICAN MINES opened by the Vogelstruisbult Gold Mining Company, a subsidiary of New Consolidated Goldfields, Ltd. With a nominal capital of £6,500,000, New Consolidated Goldfields, Ltd., is one of the most powerful gold-mining concerns in the world. You can read more on “The Modern Coal Mine” on this website.